The tread compound, unique to the SLE Sport, contains a homogenous tire filler system that includes chenically-coupled precipitated silica and carbon black. The silica allows superir wet traction without sacrificing tread wear. Additionally, the compound contans an optimized polymer matric that combines polymers of specific microstructures, allowing the compound to remain pliable even at lower temperatures. This polymer matric further enhances wet traction while reducing hysteresis which leads to lower rolling resistance. Spiral wound nylon overwrap combats centrifugal force under high-speed applications. 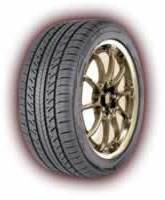 This ability inhibits tire "growth" and maintains stability and carcass integrity across the entire speed range of the tire.